Of course, there is no shortage of family cars on the market, and the competition from this segment is stiff. However, after careful consideration, we’ve compiled the seven most compelling contenders. Between two Chevy creations, the Scion twins, and gems from Ford, Kia, and Nissan. We’re confident you’ll have no trouble finding a car for your family from this fine group. With NowCar, you can look forward to the ease and convenience of buying a new car and having it delivered. Car shopping is no longer a chore - it’s a cinch. 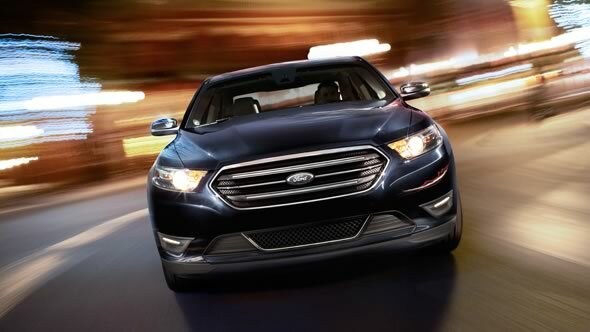 The Ford Taurus is a great full-size sedan option. The Taurus comes standard with a 288-horsepower 3.5L-liter V6 engine. It makes a great family car because it has a spacious and comfortable backseat, thanks in part to its 3.2-inch wheelbase extension. Additionally, the MP3 and SYNC capability are great entertainment features. A rearview camera and the seat belt monitoring system help parents see without looking. The Taurus SE, the most basic Taurus trim, starts at an MSRP of just over $27,000. Even though it’s compact and a fuel efficient car, the new Chevy Spark is larger and packs and more powerful punch than past models. No longer equipped with a 1.2-liter engine, the 2016 Chevy Spark has matured to the 1.4-liter four-cylinder engine, rated at 98 horsepower. With an extremely efficient engine, drivers can expect 41 MPG highway. Additionally, the Spark has tons of awesome technology and entertainment features, making it awesome for road trips. Starting at $12,660, the 2016 Chevy Spark is super affordable. Learn more about the Chevy Spark here. The 2016 Kia Optima features a brand new drivetrain, refreshed exterior, and modern features, like a 360-degree camera and bi-Xenon HID headlights. It's outfitted with a 1.6-liter turbocharged four-cylinder that generates 178-horsepower, and managed by a new seven-speed dual-clutch transmission. The 2016 Kia Optima has a starting MSRP of $21,840. Check out all of the Optima's features and specs. Sporting a brand new chassis, the 2016 Nissan Maxima has also slimmed down by 82 pounds. Its lighter structure enhances the Maxima’s performance, as does its retuned transmission and driving mode selection, which alters steering and throttle. With a refreshed interior, featuring a D-shaped steering wheel and new center dash stack, the 2016 Nissan Maxima is sure to provide a pleasing environment for drivers and passengers. Although the new Maxima has the same 3.5-liter V6 engine, it features extra power, now generating 300 horsepower. Even the continuously variable transmission (CVT) has been revised for added athleticism and improved efficiency. The 2016 Maxima was also selected by the Insurance Institute of Highway Safety (IIHS) as a "top safety pick." The 2016 Nissan Maxima starts at $32,410. The iA is the first sedan made by Scion and it has some great features. Sharing the same platform as the 2016 Mazda2, the youthful Scion iA is equipped with a naturally aspirated, direct-injected 1.5-liter inline four-cylinder engine, generating 106 horsepower and 103 lb.-ft. of torque. Standard transmission is a six-speed manual, but a six-speed automatic, featuring Sport mode, is also available. The interior includes a push-button start, a backup camera and a seven-inch touch screen. The 2016 Scion iA starts at $17,595. The newly redesigned Chevy Malibu is a midsize sedan that has long been popular with American consumers, and is routinely celebrated as one of Chevy’s best sellers and most dependable family vehicles. Rife with new technology, the Malibu has awesome available safety features like a pedestrian detection and a GM-exclusive Teen Driver system, which allows parents to set up monitors and review their child's driving. Like the Maxima, the 2016 Malibu Limited was also an IIHS top safety pick. Equipped with either a 1.5-liter or 2.0-liter turbocharged four-cylinder engine, the Malibu features a longer wheelbase by 3.6 inches, and is lighter in comparison to the 2015 model. Like the exterior, the car's interior has been completely revised for enhanced comfort and a more luxurious feel. The 2016 Chevy Malibu is priced at $21,625. Interested in the 2016 Chevy Malibu? Click here for more specs and information.